With its 460-horsepower 5.0-liter V-8, the 2018 Ford Mustang GT offers ready-made power for the masses. It’s not the top performer in the lineup, but it is Ford’s symbol for obtainable Mustang performance and it’s better than ever. The GT badge has held various meanings throughout the life of the Mustang. It started as a $165 package in 1965, starred as Steve McQueen’s hero car in the 1968 film “Bullitt,” then took the 1970s off before marking the return of performance with the 5.0 in the 1980s, much to the delight of Vanilla Ice. While performance was its hallmark in the GT-390, 0-60 mph times didn’t drop appreciably for decades. That all changed in 2011 when Ford shoved a new 5.0-liter V-8, this one with dual overhead cams, under the hood. Today, that engine and a modern suspension make the Mustang an American icon with the goods to take on the world. Join us on a trip the the Mustang GT’s history, in all its American glory. The Mustang GT didn’t start as a model, but as a $165 package that included disc brakes, dual exhaust, driving lights in the grille, badges, rocker panel racing stripes inspired by GT40, and a full gauge cluster instead of idiot lights. It also came with the equipment from the Special Handling package, which included stiffer springs, heavy-duty shocks, a 13/16-inch sway bar, and a quicker steering box. It was only available for 4-barrel versions of the 289-cubic-inch V-8, which made 225 or 271 hp. The package was not available for the early cars referred to as 1964 ½ models. For the 1966 model year, it was only offered on the hi-po 271-hp engine, but it was available for all V-8s in 1967. The elements of the 1965-67 Mustang GT equipment group carried over into 1968, but they were available for two new engines: a 230-hp, 302-cubic-inch V-8 and a much more powerful 390-cubic-inch V-8 that cranked out 335 ponies. The latter was known as the GT-390. The stripe moved up into the body and got a new “C” shape to match the body sculpting, and all the GTs rode on Wide Oval tires mounted on 6-inch-wide GT-style wheels. Ford offered the package for the hardtop coupe, the convertible, and the fastback. In Car and Driver testing, an automatic-equipped GT-390 posted a 0-60 mph time of 6.3 seconds and a quarter-mile time of 14.8 seconds. Ultimate performance numbers didn’t matter, though, when Steve McQueen drove a 1968 Mustang GT-390 though the streets of San Francisco in the movie “Bullitt” to create one of the all-time great car chase scenes. That car became so iconic that Ford has issued four special-edition Bullitt Mustang models in the ensuing years. The GT nomenclature went away for the 1970 model year and didn’t return until 1982. By now, Ford had moved on to the Fox-bodied Mustangs (and past the unloved Mustang II era of 1974-1977). The new Mustang GT was powered by a 302-cubic-inch (5.0 liters) V-8 that produced a rather anemic 157 hp and motivated the car to 60 mph in 8.1 seconds. Buyers could also choose a 120-hp 255-cubic-inch V-8 as a credit option. The car featured bucket seats, power brakes with larger front discs, Ford’s “handling” suspension, and a locking rear differential. The Fox platform that debuted in 1979 for the third-generation Mustang also underpinned those performance stalwarts, the Ford Fairmont and the Mercury Zephyr, but it created a light, nimble Mustang. 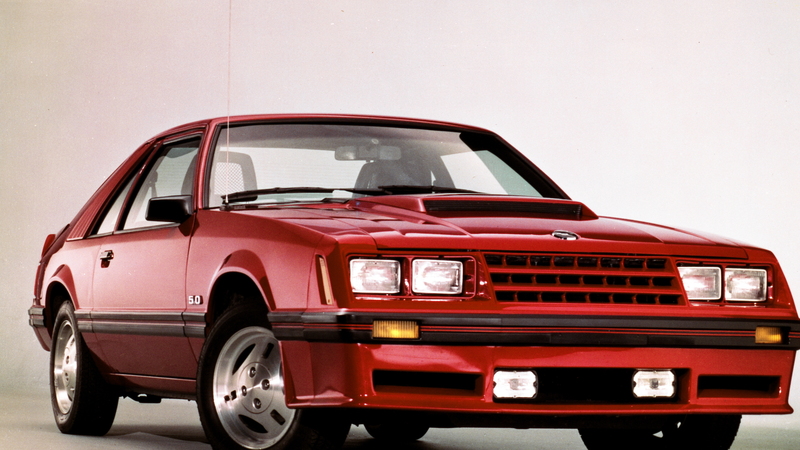 In ’82, the Mustang GT was offered only in a hatchback coupe body style. The third-generation Mustang received its first facelift in 1983, with a rounder nose and a narrower grille. A convertible body style returned to the Mustang lineup for the first time in a decade and became available for the GT. Ford bumped the 5.0-liter V-8 to 175 hp with a new carburetor and changes to the valvetrain and exhaust system, and switched the manual from a 4-speed to a new close-ratio 5-speed Borg Warner T-5 gearbox. The GT also received wider 220/55 tires on wheels slightly larger than 15 inches, a larger anti-roll bar, softer rear springs, and higher-effort steering. Mid model year, Ford added a 140-cubic-inch turbo-4 version of the GT using the engine from the Thunderbird Turbo Coupe. The engine produced 145 hp and 180 pound-feet of torque. While the V-8 GT could conquer the 0-60 mph run in close to six seconds, the Turbo needed almost 10 seconds. Worse yet, the Turbo lacked an automatic transmission and air conditioning and cost $250 more than the V-8 GT. Only 483 1983 Turbo GTs were built. 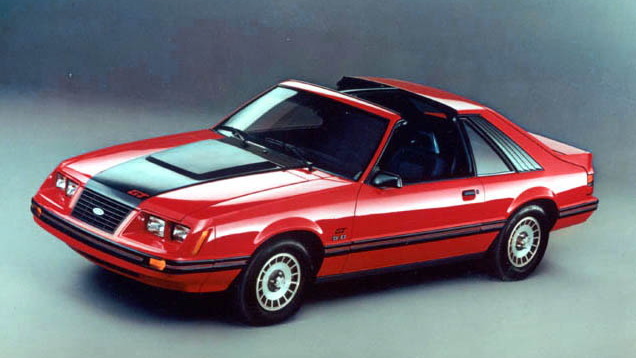 For the 1987 model year, Ford toyed with the idea of a front-wheel-drive Mustang based on a Mazda platform, but decided on a refreshed Fox-body car instead after protests from Mustang fans. The revised 1987 Mustang had a smoother look with flush-mounted headlights. The 302-cubic-inch V-8, the famed 5.0, was now up to 225 hp, matching the Mustang’s Camaro and Firebird rivals. 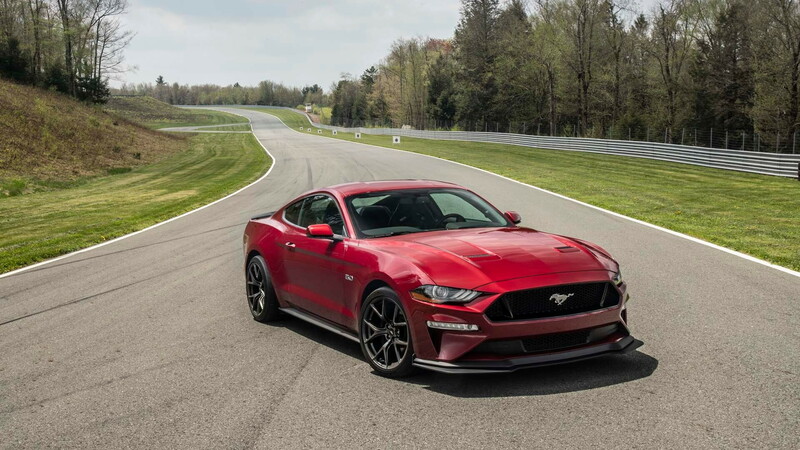 The Mustang was about 100 pounds heavier than before, so the 0-60 mph time was still in the six-second range, but now the top speed was just under 150 mph. The engine became as much of a star as the car. Vanilla Ice bragged about “Rollin’ in my 5.0” while sampling The Steve Miller Band. Buyers could also get the 5.0 and the GT’s sport suspension in the less flashy LX trim, which proved popular as a sleeper pick. GT or LX, the Mustang was a performance bargain, priced about $3,500 less than the Camaro. Ford spent $700 million to redesign the Mustang for 1994, far less than the $3 billion it had spent on the 1986 Taurus. That meant the Fox platform would remain, though Ford made it much stiffer and now called it Fox-4 while the new car was code named SN95. The body received a new design that incorporated elements of the old and the new. In all, 1,330 of the 1,850 parts were new. Under the hood of the GT the 5.0 returned, now with 215 hp, 60 less than the Camaro and Firebird. Car and Driver posted a 0-60 mph run of 6.1 seconds and a quarter-mile time of 14.9 seconds, numbers that were no better than they had been a decade earlier. Buyers could get the GT in a notchback coupe and a convertible, with prices up considerably from 1993 despite the carryover underpinnings. Ford gave the SN95 Mustang a refresh for 1999, the biggest changes were sharper edges for the lower portions of the body; Ford called it New Edge Design. Straight-line performance was finally starting to improve. Ford had swapped out the GT’s pushrod 5.0-liter V-8 for a 4.6-liter dual-overhead cam V-8 in 1997, but this year it added 35 hp for a total of 250 and that made the difference. Motor Trend posted a 5.4-second 0-60 mph run and a 14.0-second quarter-mile time, both of which still trailed the Camaro. All Mustangs handled better, too, thanks to a wider rear track that now matched the front, firmer springs, and better on-center feel for the steering. Nonetheless, the Fox body roots of the car went back to 1979, and the structure was weak compared to more modern cars. 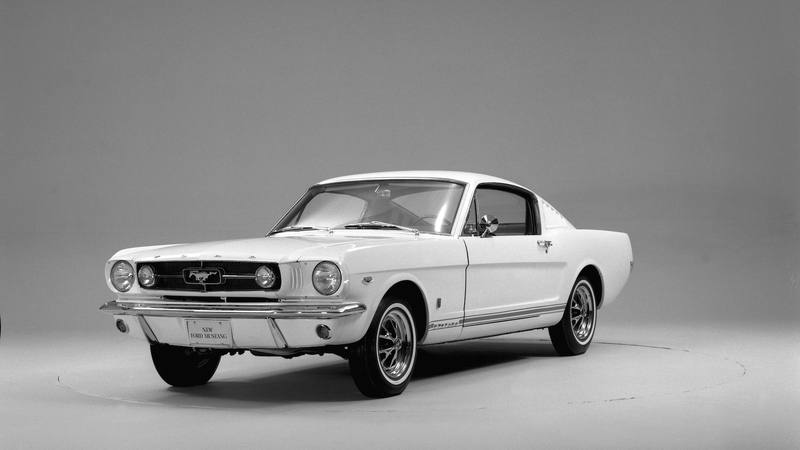 Ford had continuously updated the Mustang, but hadn’t put real money into it for decades. Ford finally reworked the Mustang from the ground up for the 2005 model year. The new look was decidedly retro. Chief designer J Mays cherry-picked exterior elements from the past; the nose came from the 1970 model, the fastback from 1969, and the C-shaped character lines from 1965. The wheelbase grew by 5.8 inches to 107.1 inches, but the weight increased by only 100 pounds to 3,450 pounds for the Mustang GT. The new platform let Ford engineers fix the ergonomic issues that had plagued the interior for so many years, and it, too, had a retro look with an instrument binnacle right out of the 1960s. Under the GT’s hood, the 4.6-liter V-8 returned. Now it pumped out 300 hp and 5.5-second 0-60 mph times for about $25,000. Unfortunately, the S197 Mustang, as it was called internally, received a solid rear axle instead of an independent setup, a concession to keep the price down. 2011 Ford Mustang V-6. Photo: Anne Proffitt. Ford finally unlocked the GT’s power achievement for the 2011 model year when it retired the modular 4.6-liter V-8 and brought back the 5.0 badge. The new Coyote aluminum-alloy, 32-valve, dual-overhead cam V-8 featured new heads with variable cam timing. It spun out 412 hp, up from the 4.6’s 315. Ford also tweaked the GT’s suspension, switched to electric assist power steering, added sound deadening, and offered an option for a Brembo brake package with 14.0-inch diameter rotors, 19-inch wheels, and summer performance tires. The changes did wonders for performance. Motor Trend launched a Mustang GT from 0-60 mph in just 4.3 seconds and covered the quarter mile in 12.8 seconds. A 2015 update gave the Mustang something enthusiasts had been clamoring for for ages: an independent “integral-link” rear suspension. Ford also widened the rear track and revised the front suspension geometry to better work with the new rear end and accept larger brakes. An improved interior received higher quality materials, more space, and better ergonomics. On the outside, the redesigned body benefited from a sleeker, lower, wider version of the look the car already had. Fastback coupe and convertible were once again the body style choices. Up front, Ford gave the Coyote 5.0-liter V-8 a mild update to produce 435 hp and 400 lb-ft of torque. 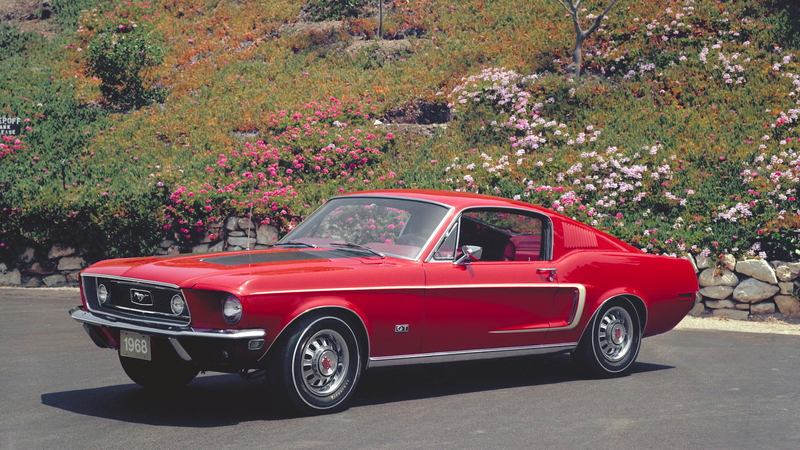 Ford sold this Mustang worldwide, and for the first time offered it with right-hand drive. The 5.0-liter V-8 now makes 460 hp for 2018 and buyers can choose a new 10-speed automatic transmission instead of the 6-speed. Together, these upgrades cut the 0-60 mph time to 3.9 seconds. However, the real performance gains come from Performance packages 1 and 2. Performance Pack 1, which has been offered since 2015, includes 255/40 front and 275/40 rear summer performance tires on 19-inch wheels, six-piston Brembo front brakes with 15.0-inch rotors, a K-brace, a strut-tower brace, heavy-duty front springs, a larger rear sway bar, a larger radiator, a rear wing, and a Torsen limited-slip differential. To that the new Performance Pack Level 2 added wider 19-inch wheels mounted on 305/30 Michelin Pilot Sport Cup 2 tires, track-inspired springs and front sway bar, magnetic ride dampers, a front splitter, and a different rear wing. This package, which costs $6,500, is Ford’s answer the Camaro’s 1LE option, and it turns the Mustang GT into a track performer and a true sports car.